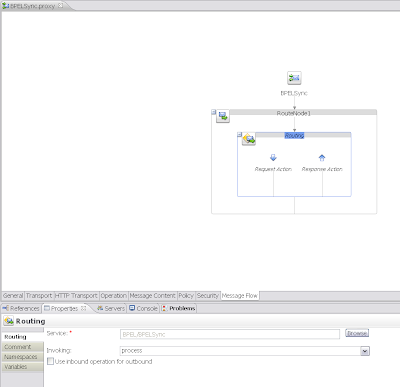 In JDeveloper 11g a Task Flow region can exists isolated in your ADF page, but there are ways to interact with this region. For example you can use input parameters like I did in this example or you can pass ADF pagedef events to the region like I did in this example. In this blog I will use queueActionEventInRegion method to start a navigation action in the Task Flow from the mainpage so it goes to the next page fragment and I will use a regionNavigationListener on the region to get the current displayed page fragment of the region so I can use this in the mainpage to disable some buttons. ( Thanks David Giammona for the great region interaction paper ). Here some pics of the example I made. In the mainpage I have two buttons with these buttons I pass a event to the region so it goes to the next pagefragment. When this happens the regionNavigationListener is fired and the new displayed view is passed on the mainpage so I can disable the right button. 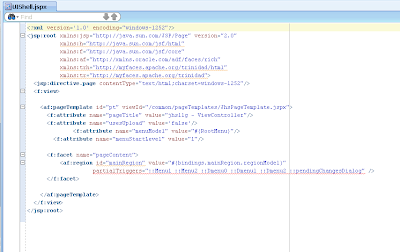 Here is the mainpage jsf page code with the regionNavigationListener on the af:region component. and here is backing bean code where I pass a queueActionEventInRegion event so it navigates to the other page fragment. 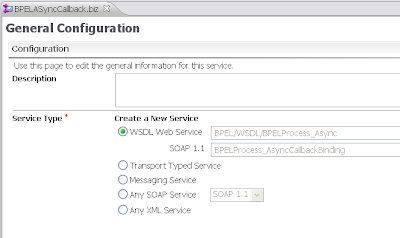 In my previous blog I already talked about calling BPEL services from OSB. 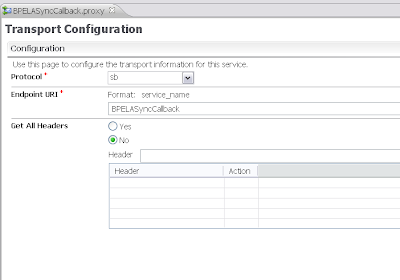 In this blog entry I will show you how to call an synchronous OSB proxy service from BPEL. If you have problems to get this working, please see my previous blog entry how to solve this. 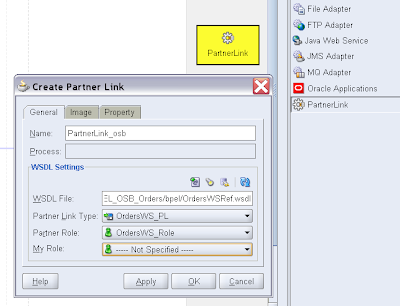 I got this working with OSB 10.3 and Soa Suite 10.1.3.4 MLR5. 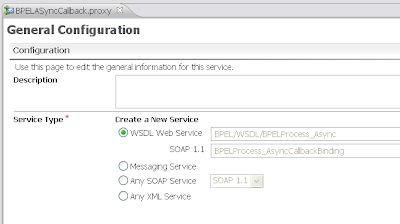 Export the WSDL of the OSB Proxy service and put the wsdl and xsd's in your BPEL project. 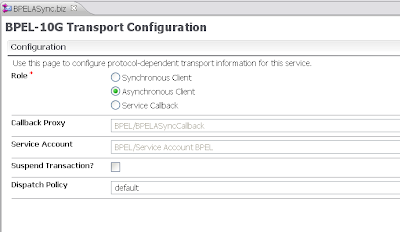 With OSB 10.3 ( BEA Aqualogic Service Bus ) you can call BPEL services with the ormi or opmn protocol ( just like OESB ). 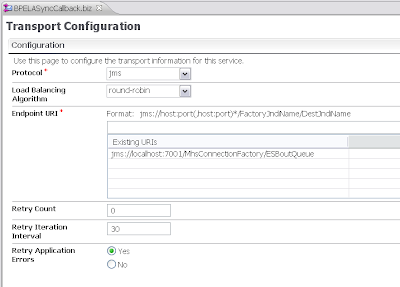 With version 10.3, OSB support the bpel 10.1.3.4 transport. 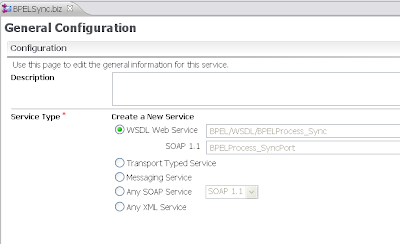 In this blog I will show you how to call the BPEL services from OSB. 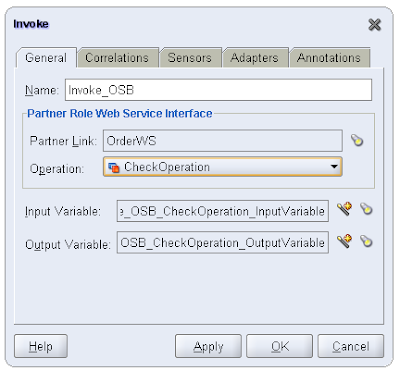 Calling OSB services from BPEL is also possible but I'll explain this in an other blog entry. 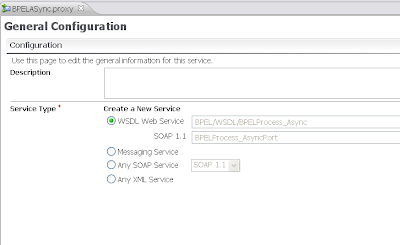 I got this working with the MLR5 patch for Soa suite 10.1.3.4. Step 2 is to replace the bpel jars in the bpel transport ear. Go folder osb_10.3\lib\transports and open bpel10gtransport.ear and replace the following jar files orabpel.jar, orabpel-common.jar , xmlparserv2.jar and oc4jclient.jar with the ones you can find in the soa suite 10.1.3 home. 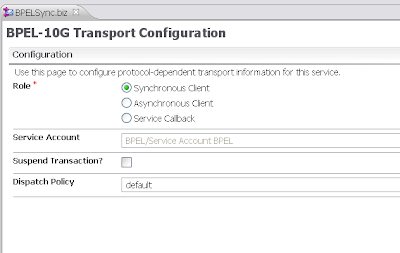 Select the bpel-10g transport. As endpoint we can choose between opmn or ormi. For ormi we can use this url ormi://localhost:12401/default/BPELProcess_Sync Where 12401 is the rmi port of the OC4J container and BPELProcess_Sync is the name of the BPEL service. Don't use orabpel in the url. You can also use opmn://localhost:6003/home/default/BPELProcess_Sync where 6003 is the opmn port and home is the name of the OC4J container. That's all for a Synchronous BPEL service. 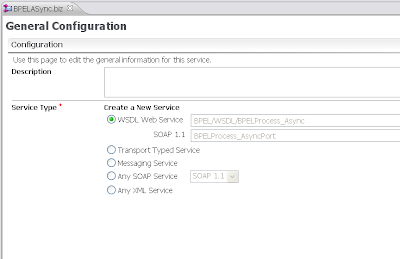 that's all for the Asynchronous BPEL service. For more information see the OSB bpel transport page. Here some code which you can use in your backing beans, I use this code all the time. 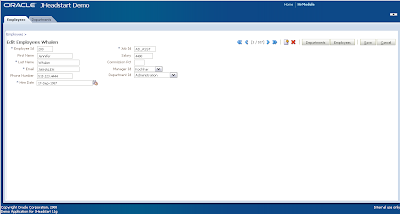 With this you can retrieve the data or actions from the ADF page definition or create new uicomponents with ADF definitions and some JSF methods. I'll keep this page up to date. Let me know if you have some code. // handle to  binding container of the region. 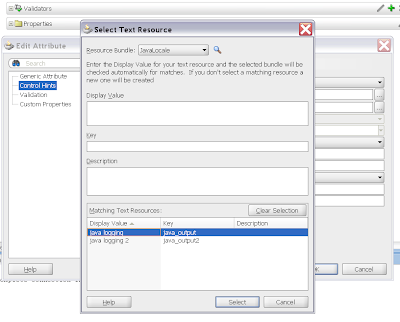 JDeveloper ADF supports the use of resource bundles for the label and tooltip values of an attribute. 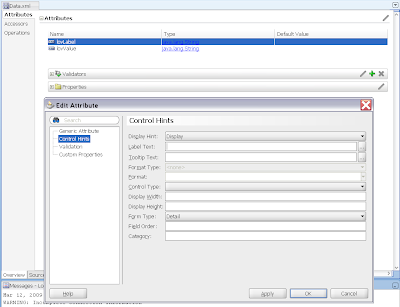 This attribute can exists in an ADF datacontrol class or an ADF BC object. In this blog I will show you how you can set these values manually or generate these values with ANT. First we will do this manually. In every project you can set the resource bundle option. Default is one resource bundle per project. 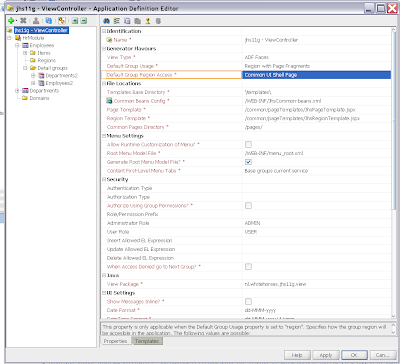 This is an example of an ADF datacontrol class file with a label property and a resource bundle definition. We can also generate resource bundles with Ant. Steve Muench already made in 2004 a example how to do this. I changed the example a little bit so it works in 11g. First we have to make a xml with the resource values which matches our attributes of an ADF datacontrol class or an ADF BC object . Put your xml file with the xslt file and the ant scripts in the root folder of your model project. The xslt file will generate the java resource bundles. Change the build.properties file and set your jdeveloper 11g home. Now we can run the ant scripts. Here you can download the required files. The generated java resourcebundle looks like this. // CODE GENERATED BY XSLT From AllMessages.xml - Do Not Edit This File. You can see that label resource has the following name convention attributename_LABEL. 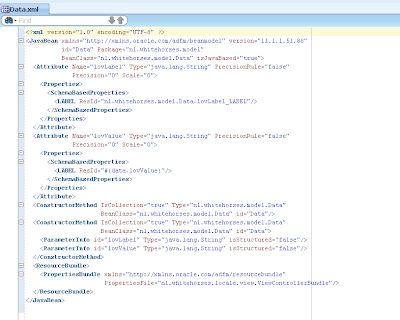 Now we only have to add this resource to the ADF datacontrol class xml file. 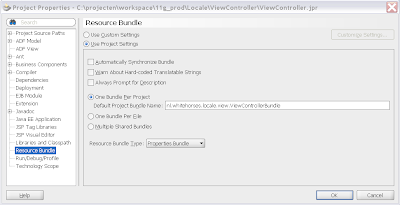 Open the xml and go the structure window and a ResourceBundle element with a JavaResourceBundle child element. 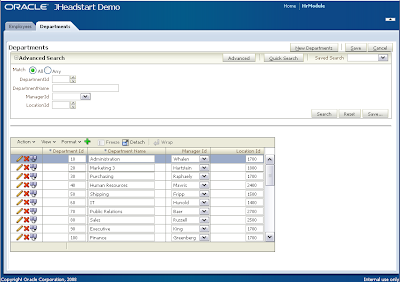 Steven and his team released this week a technical preview of JHeadstart 11G. This great add-on for JDeveloper 11G can help you to generate a good looking web application which is based on best practices. This tool is a must have for developers who wants to generate professional ADF 11g web applications. 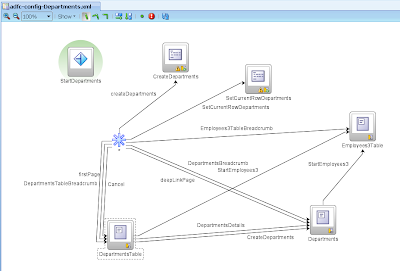 A very good thing about this generator you still can re-use generated Task Flows. If you don't like to generate an application ( really, they exists , I just want to generate everything ,so I can show the customer results and after that I can do cool things ) you can always use this tool for prototyping or for the best practices, this tool is the advanced ADF course, if you understand this you are 11G professional. Here some pics. 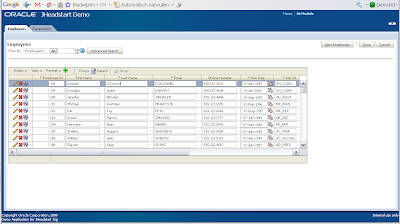 this is an one page application with lot of regions. 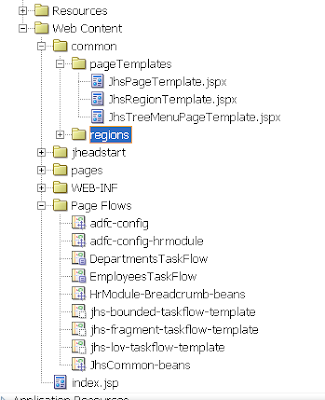 JHeadstart still uses velocity templates and now it has page and task flow templates. A lot of templates. The application definition editor, Now you have one defintion where you can add services ( in 10.1.3 you had for every ADF BC am an definition file) and we can define global LOV. I know that I can learn from this tool and I think you too if you are an ADF developer. So money well spend.